Other members of the Committee are representatives from St Swithin’s Church, the Methodist Chapel and other Groups operating in the village. Bicker Village Hall is an independent charity and the Management Committee need to raise £5-7000 each year to maintain operation. In 1936 a committee started raising funds to purchase a site for a village Hall. Penny whist drives were held in the school but then the Second World War years intervened and the project was shelved. After the War, interest was revived and fundraising began again. Many local residents made generous donations to the funds and interest free loans were also given. A wooden cricket pavilion, for sale at £300 by a Mr W Dods of Donington, was purchased outright because the Hall had funds of £489 6s 0d. The pavilion was erected on the new site during 1949 and converted to suit the village community. The Hall was officially opened on September 16 1950 by the then Conservative MP for the area, Mr Herbert Butcher. The opening of the Hall was an opportunity to party. In the afternoon there was an indoor/outdoor garden party and fete. In the evening a Social was held with music provided by Ron Diggins and his Diggola. The wooden pavilion continued to be used until the 1980s when modern-day regulations decreed that the Hall should be brought up to a better standard. Lincolnshire County Council and Boston Borough Council agreed grants and loans BUT a further amount of £15,000 had to be found. Fundraising to replace the wooden pavilion started in earnest. At one time over £1000 per month was being raised. Weekly Bingo sessions began and these alone provided an outstanding £7000 to swell funds. Four local people undertook a sponsored cycle ride from Edinburgh to Bicker and this raised £2000. Regular donations from village residents helped swell the coffers and everyone in the village gave generously both of their money and their time. Jumble sales, Whist Drives, Discos, Christmas Fairs, Fun Days, Social Evenings and Keep Fit sessions brought in yet more cash. Work began on rebuilding the Hall. The old wooden pavilion building was dismantled. It was sold to Brian’s Trading Post at Gosberton Clough for £300 (the original cost of it in 1974) to be re-used as a farm workshop. 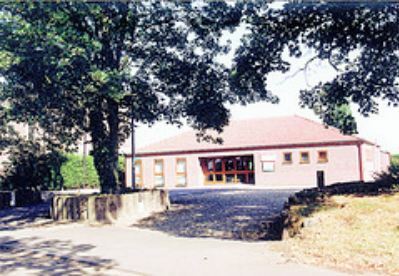 The new Hall was opened on October 25 1986. The ceremony was performed by Dr John Cope of Swineshead. His late father had been one of the members of the original Hall committee. To celebrate the opening, the day’s festivities continued with games, competitions and a history of Bicker competition compiled by local historian Miss Hilary Healey. During the day the Dawson family’s fairground provided music in the car park. In the evening local organist Mr Desmond Spriggs played for a family social evening. The Hall was built to accommodate 100/150 people. The committee rooms are ideal for small functions. The Gedney Room is named after local benefactors who generously provided furnishings. The Hall is an independent charity and needs to raise £5-7000 every year to maintain it in operation so please do come and support the events.